PhotoAndVideoEdits.com is offering a free before/after photo editing widget for your website that comes pre-loaded with examples of before and after editing. 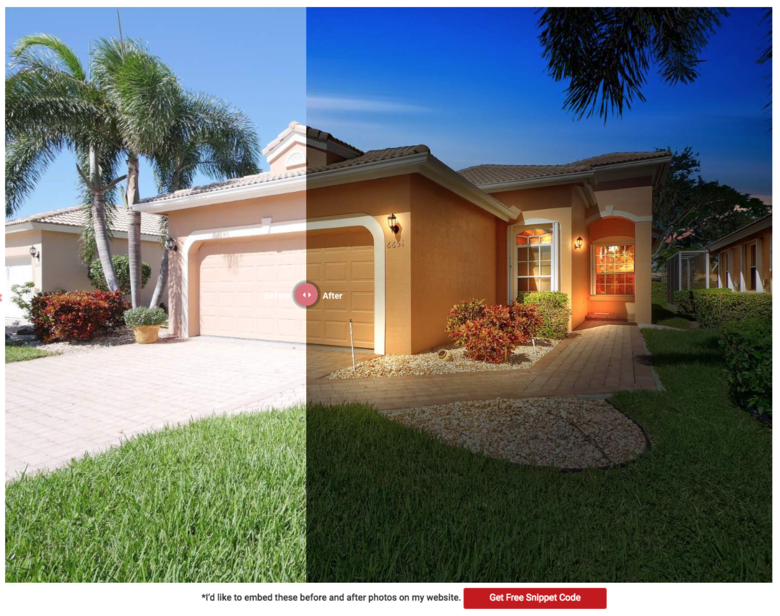 Whether you edit your photos - or engage PhotoAndVideoEdits.com to edit your photos – this before/after photo editing widget is a powerful, free tool to help highlight/differentiate to potential clients your photo editing services. P.S. For PhotoAndVideoEdits.com special offers, please see this WGAN Forum discussion. This is a note to sing the praises of Colin Forte. Yesterday I took a look at this cool widget. There was a bug in it where the slider widget, if it got near the left/right edges, got stuck there. I wrote to Colin and overnight it was fixed. It's now perfect. If you're a photographer and haven't yet tried Colin's PhotoAndVideoEdits.com - you should. The service and quality has been great for months now, and I've run many jobs through it. But on top of that, how often have you pointed out a glitch to some company's tech support and had the issue fixed perfectly in less than 12 hours?? Thank you very much for your kind words. For anyone wondering, no consideration was given for this review! Aside from giving what we believe to be the best ‘value for money’ regarding our product, my main focus is turn around time. This not only applies on photos but also on customer service. I live by the motto ‘never put off until tomorrow what can be done today. You can use the free before/after photo widget from PhotoAndVideoEdits.com, even if you are not a PhotoAndVideoEdits.com client.